The Six Flags Over Texas is used to describe the six nations that had sovereignty over portions of the territory of the U.S. state of Texas. The “six flags” are also shown on the reverse of the Seal of Texas. The first explorations into Texas were by the Spanish. The first was a map making expedition in 1519 led by Alfonso Alvarez de Pineda and Cabeza de Vaca. Soon after came explorers Francisco Vasquez de Coronoda in 1540 and Jaun de Onate in 1601. French explorer Robert La Salle established Fort St. Louis on Matagorda Bay. He was hoping to start a settlement in the French Louisiana Territory at the mouth of the Mississippi River. Not realizing he was so far off, 150 people landed on the banks of the Garcitas Creek. Life was extremely hard and their numbers slowly dwindled to about 40 by 1687. La Salle left for the Great Lakes for French re-enforcements but was killed by his own men on the journey. The few remaining inhabitants of Fort St. Louis were all killed by Karankawa Indians in 1689. In 1821 Mexico gained independence from Spain and the region of Texas became part of Mexico. The Austin family received a grant to settle 300 US citizens in the new territory. These settlers were led by Stephen F. Austin. Many more soon followed. Santa Anna was elected governor of Mexico in 1832 and soon after sent troops into Texas to force martial law. The Texans first rebelled at Goliad in 1835. A troop of Mexican soldiers had come to get their cannon and the Texians refused – making a flag that said “Come and Take it!” The Texians then took over the city of San Antonio. On March 2, 1836 at the town of Washington on the Brazos, a group of 59 representatives voted to declare Texas independence. Just 4 days later, on March the 6th, Santa Anna led his army to the Alamo where he had all survivors executed. He marched on to Goliad and had everyone shot there as well. General Sam Houston and his army of Texians faced their final battle with Santa Anna along the banks of Buffalo Bayou. They fought and won independence for Texas at the Battle of San Jacinto on April 21, 1836. Sam Houston was elected the first president of the Republic of Texas. The small town of Waterloo was chosen to be the capitol and it was renamed Austin – in honor of Stepehen F. Austin. The last president of the Republic of Texas was elected in 1844 – Anson Jones. He ruled just 1 year before Texas joined the United States. 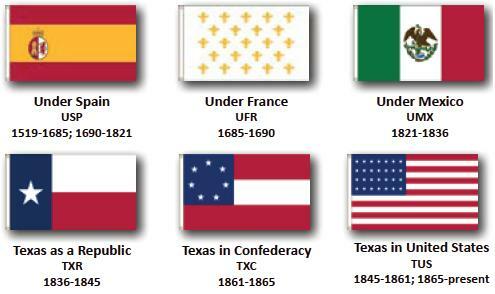 In 1845 Texas became the 28th state of the US. The US president at the time was James K. Polk. In a special ceremony J. Pinckney Henderson became the first governor of the State of Texas.